Glam Polish - She Had A Lipstick Taser is the last of my polishes my friend brought me from Australia (but not the last of my Glam Polishes). It's also Despicable Me themed! She Had A Lipstick Taser is a blue crelly base (I used 3 coats) and there are white and pink glitters. I'm so pleased that I was able to get my hands on this collection and that my friend was kind enough to bring them in her luggage for me (I've already asked her to do the same the next time, hehe). I love the name. Lipstick Taser. I need one of those. 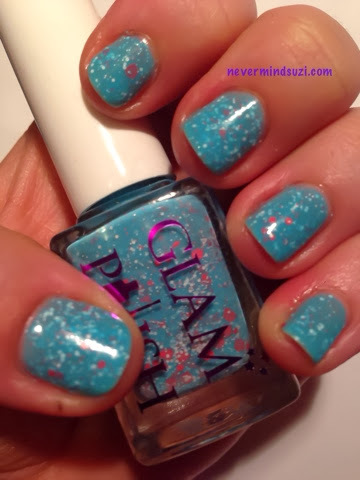 The polish is pretty with the jelly look and it looks squishy and has an undersea look.